Many users have the same problems on playing movies from USB on TV. if you have trouble in playing movies on TV via USB, here is the best solution for you. If your television set has a USB port, you may be able to use it to watch movies that you have downloaded or copied from your computer. Exactly what movies you can watch depends on your set, the video files and possibly even the USB drive itself. A range of variations and restrictions means that USB playback often shouldn’t be a key deciding factor when choosing a set. Do not simply assume that because a television has a USB port, it can play files from a USB drive. In some case the port is solely designed for use by engineers who need to run software on the television, for example to update or repair the set. Some sets may only be able to display video files once you have enabled an option in a service menu that isn’t officially publicized to consumers; take care with such menus as you could affect the TV’s performance by changing service menu settings. If your TV does support video playback from USB, the main factor that affects your ability to watch a particular video is the file format. You will need to consult the user manual or promotional material for the particular set to see which formats it supports. Formats which are supported on many sets include MPG, MP4, DIVX, XVID, WMA and AVI, though it’s common for a particular set to support only some of this list. Formats which are more rarely supported include MKV (used often for sharing high-definition content online), VOB (the files used on DVDs) and 3GPP (a format used on older cellphones with video cameras). Some sets will only play a video in a supported format if it is at a specific resolution or within a particular range of resolutions. All these limitations mean you may need to convert or re-encode some video files to watch them through USB on your particular set. Note: In order to enjoy Any Video files on USB on TV, you need to convert the AVI/MKV/WMV/MPEG/MATS etc files to TV supported format like MP4. 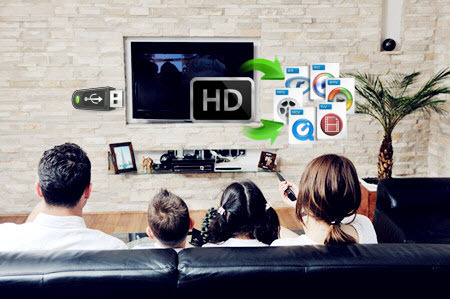 Learn >> HDTV Supported formats. Here, Simple Pavtube Video Converter Ultimate is the best. 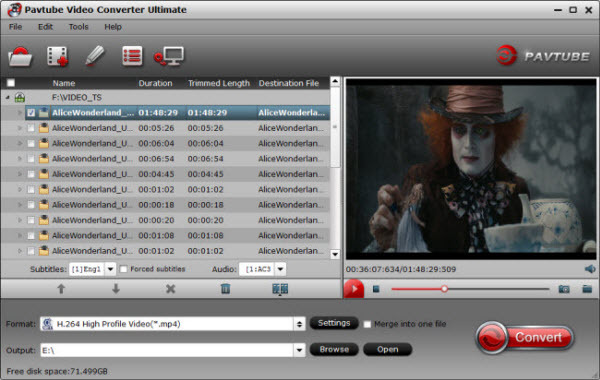 Learn Why Choose Pavtube Video Converter Ultimate? With it, you can ripping the latest 3D/2D Blu-ray, DVD as well as the HD video files from Blu-ray/DVD for TV and convert to such as AVI, WMV, RMVB, MOV, MPEG-4, H.264, MKV, VOB, etc various video formats for some popular smartphones and tablets as well as editing software. Besides, you can also handle the latest Blu-ray/DVD. With this smart tool, HD Videos to MP4 conversion becomes so easy and fun. The Mac version is: iMedia Converter for Mac. Other Possible Limitations Even if you are using the correct formats, you may still run into problems with watching videos from a particular USB drive. You may have to format the drive to a particular file system such as FAT, FAT32 or NTFS (see Resources). Your set may not be able to show files that are stored inside folders on the drive. Your set may be limited in the length of filenames it can display, or be unable to show unusual characters in a filename. It’s also possible your set only supports USB drives of a particular range of capacities. Consoles If you have movies on a USB drive but no USB port on your television, you may still be able to view them on the TV. Game consoles such as the Playstation and Xbox can play many types of video content from a USB drive inserted into the console. As with televisions, not all formats of video file are supported. Remember that the console may also be able to play video files located on your computer itself, as long as both the console and computer are connected to the same local network. Depending on the software you use, this may make more video file formats viewable than simply using a USB stick. Legal Note Copying or downloading a video file without the permission of the rights holder may lead to civil and/or criminal legal action in many jurisdictions.